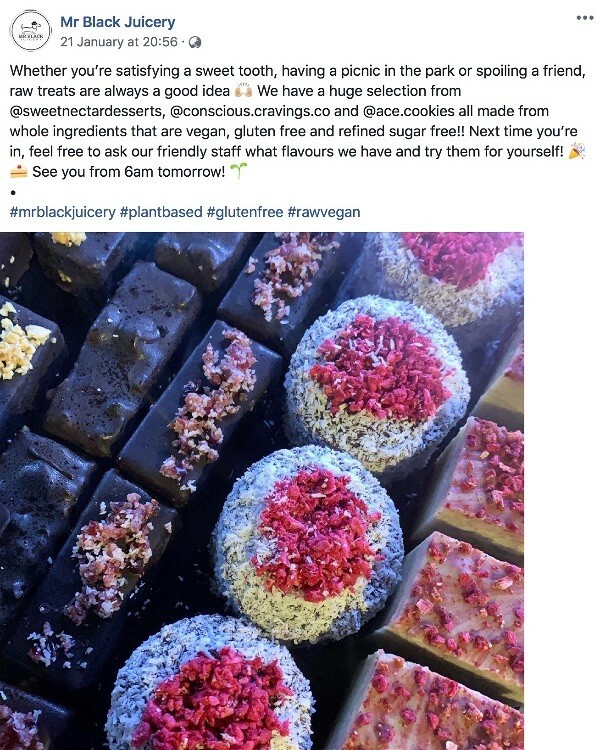 Don’t be deceived by the name, Mr Black Juicery is far more than a juice shop. 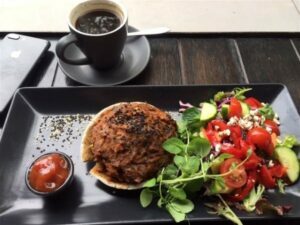 It is a thriving cafe creating healthy dishes for breakfast, brunch and lunch as well as drinks and snacks for in between. 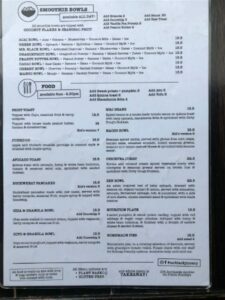 The food is 100% gluten free and is plant based, so fantastic for gluten free vegetarians and vegans. 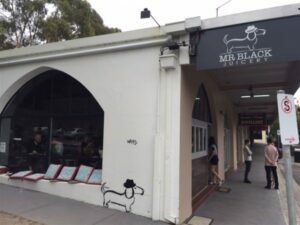 Mr Black Juicery also features on the Melbourne 100% gluten free listing. Located in Berwick, a south eastern suburb of Melbourne, it is around 40 minutes drive from the city on the M1 freeway, just one suburb further out from Cranbourne and Narre Warren. Seeing juicery is in the name, I will start with the juice! 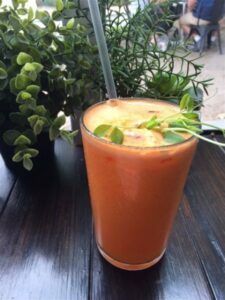 I love fresh juice and there is a choice of six fresh juices on the menu. There have many dairy free milks, so you can have a coconut milk chai or a nut milk coffee. The menu has a good variety of meals, such as smoothie bowls, quinoa porridge, buckwheat pancakes, poke bowls, nachos, avocado on toast, chickpea curry and vegetable pies. 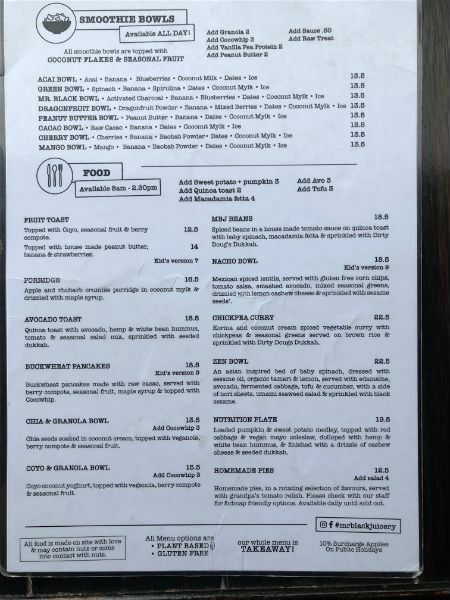 The food menu (in January 2019) is shown below. The avocado toast is really filling and you can see the nutrition on the plate! It comes with salad and I added some macadamia feta ($4 extra). My husband opted for the vindaloo pie, which was a pot pie (ie without pastry) with a mashed potato topping. He would normally prefer a meat pie, but was still pretty happy with this offering as I think the chilli for him made up for it being meat free. If you prefer a sweet breakfast, try the dairy free buckwheat pancakes! I shared this with a friend and was just the right amount for me. 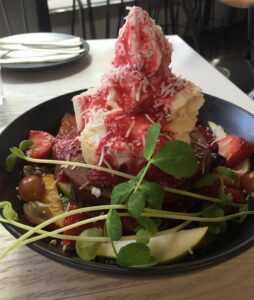 The coco whip ice-cream was nice and there is a lot of fruit around the pancakes to add lots of different flavours. They have a huge array of gluten free cakes and slices, that are also vegan and mostly raw. Apologies for the glare on the photo, but it gives you an idea of the goodies on offer. 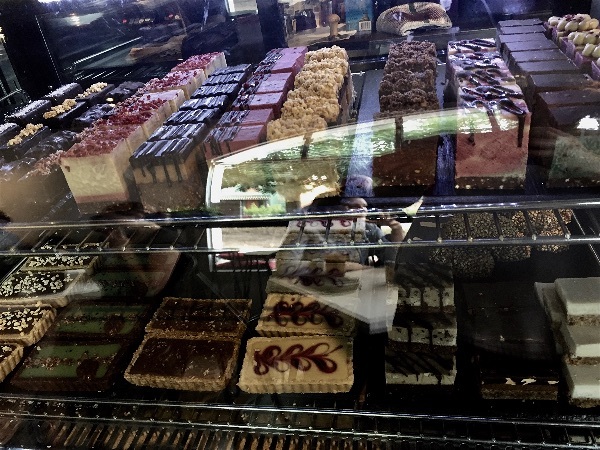 Many of the cakes are supplied from other gluten free bakeries in Victoria. 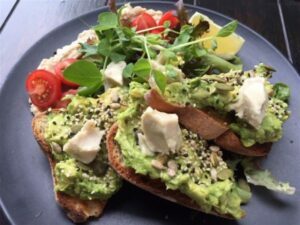 One of them, Conscious Cravings, also has a small cafe and is featured on the 100% gluten free Mornington Peninsula post. 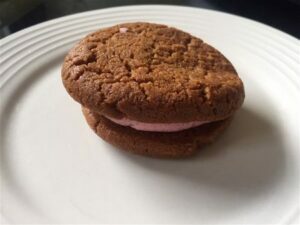 I took away a musk cookie for my afternoon tea, as I really loved musk sticks as a kid. I enjoyed the cookie but found the musk didn’t have quite the same appeal for me as a biscuit filling but it was worth a try! We visited on a Sunday morning and the cafe was nearly full, so it is obviously very popular with the locals. There are also some tables outside on a grassy area, which is helpful if you have your dog with you. Mr Black Juicery is well worth a visit for gluten free in Berwick for lovely, fresh food and friendly service!